I, like a lot of hoarders, happened to have several old and out-of-date books on my reference shelf and as you can imagine several are on Greece. So I thought we’d take trip back in time to the summer of 1983, a bygone era when the Police were at number one with their stalker-y hit “Every Breath You Take” and literary greats like Stephen King were making us weary of classic cars in his novel “Christine” and Chevy Chase was taking a family road trip in “National Lampoon’s Vacation” in the theaters. Let’s sit back, relax and research a trip to Athens in 1983. 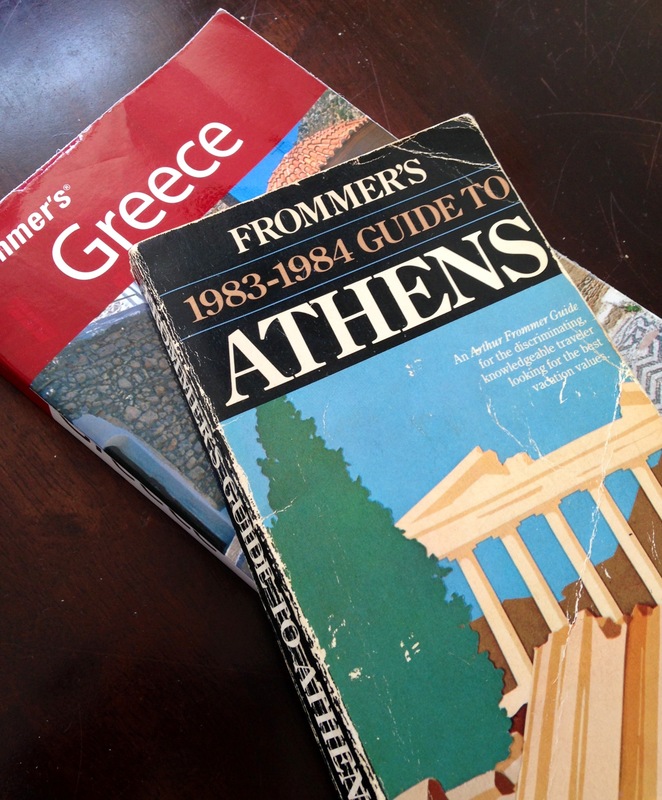 We’d all probably jump at the chance to visit Greece and pay the prices in this 1983 Frommer’s guide, but would that be an economic advantage? The old Athens airport was small, extremely small, and it was located right in the city. I loved that location for the view. When you flew in you could see the city sitting in the vast caldera and the Acropolis at the its center. You only needed a quick (and very cheap) bus ride to the city center. The bus would most likely drop you off at Sytagma Square (Constitution Square), the center of Athens and home of parliament and the perfect jumping off point to find your hotel and journey the ancient downtown known as Plaka. Where would you stay? Let’s take a look. The book I’m reading is complaining about the rise in costs from a few years ago. In ’83 the Athens Hilton had double rooms going for a max of 11,612 drachmas (no EU yet) or $194. The current price for a double room at the Athens Hilton can be $342 a night. But don’t rush to the conclusion you’re getting gypped. When we calculate the inflation rate you come out ahead in today’s dollars; that $194 in 1983 dollars is $455 a night. Other hotel options aren’t so favorable. The moderately priced hotels like the Hotel Herodion had double rooms for $41 in 1983; that’s $96 accounting for inflation. Today a room goes for $236, you lose the inflation war here. “If you need to survive on pennies a day, you needn’t get skinny in Athens. There are plenty of restaurants in this guide where you can eat, and eat well, for under 360drs ($6),” says Frommers 1983-1984 Guide to Athens. The inflation calculator puts that $6 at $14 in today’s money, which doesn’t sound bad until you realize your average modern meal is about $20 — not including wine. The tickets to the Acropolis in 1983 were $1.08 ($2.50, adjusted). Admission today will run you $16. It’s almost like they just realized you can make money off a global treasure. The point of this exercise in economic time travel is to remind us that when “seasoned” travelers regale you with tales of rooms for $20 and meals for pennies, you can bask in the glow of their good-old-day memories, but don’t forget that inflation can change the story in a hurry.